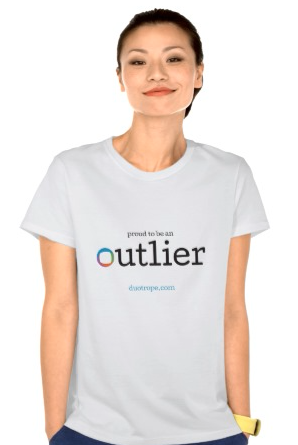 Proud to be an Outlier? Show the world! The Basics: What is an "Outlier"? An outlying observation, or outlier, is one that appears to deviate markedly from other members of the sample in which it occurs. How does Duotrope determine what submission reports are considered outliers? Over the course of several years, we developed a complex algorithm to determine outliers. It looks at a variety of factors involving both the market's statistical patterns and the user's statistical patterns. Also, note that all submission reports are constantly being re-evaluated as statistical patterns change. A report that was not originally considered an outlier can be considered an outlier at a later date, and vice versa. What does Duotrope do with outliers? By default, outliers are not included in the Response Statistics on our market listings. However, there is an option to include outliers in the statistics. Simply check the "Include outliers" box and click the "Display" button. Note: Just because one of your reports was considered an outlier doesn't mean that they all are. Apart from making sure your submission records are as complete and accurate as possible, there is no need to do anything. The system is working as intended. Our admins cannot change the status of outliers as they are under constant evaluation by the outlier algorithm. We do not manually handle outliers. Can you tell me why it was considered an outlier? No, we cannot. Our algorithm requires intense computing. It is not something that we can calculate by simply looking at the reports in question. Do you think I'm lying? I swear I'm not! No, we do not. It simply means that your report is outside of statistical norms. I've been lucky, and my acceptance ratio is high. Now it seems all or most of my reports are considered outliers. What should I do? Congratulate yourself! You haven't just been lucky; you've been highly successful! If Stephen King were to use Duotrope, his submission reports would be considered outliers, too.